The lines from Robert Burns’ poem To a Louse ‘O wad some Pow’r the giftie gie us, To see oursels as ithers see us!’ sprang to mind recently when visiting the British Museum’s FREE display What is Europe, A View From Asia (Room 3, on the right as you enter the museum from Great Russell Street entrance). This is a small exhibition, supported by a Japanese newspaper, of objects from Japan, China and South Asia which illustrate the relationship between Europe and that part of the world from the 18th to the mid-20th century. 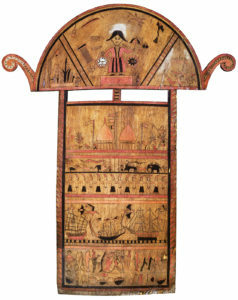 The nineteenth century painted hentakoi board from the Nicobar Islands is a wonderful example. It shows a European ship as well as an oriental junk and a local fishing vessel and the deity at its top carries a chronometer, a parasol and a compass, as well as being surrounded by indigenous objects and creatures. The Nicobar Islands were first colonised by Denmark in 1756, then sold to Britain and finally became a territory of India. Other items on display include a protective deity or kareau, wearing a European pith helmet. 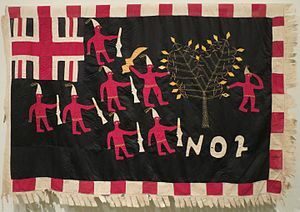 Such images and objects reminded me of the West African Asafo company banners, covered with applique figures wearing elements of European dress, or carryig European weapons, which I had liked so much when they were part of the Tate’s exhibition Artist and Empire in Winter 2015/16. It is, of course, the technology which seduces the artists, of navigation on the Nicobar Islands, of conquest in war-like West Africa. In Japan it was religious iconography – adding western accoutrements to traditional Buddhist sculpture meant better exports abroad, but also allowed them to be used by Japan’s Christians – at a time when Christianity was forbidden – as votive Madonna and Child objects. 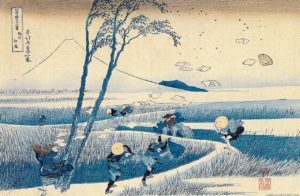 Asian and, in particular, Japanese art was very influential on Western artists, not least the Impressionists, as David Olusoga’s The Cult of Progress (Civilisations, Episode 8, BBC) showed so eloquently and the BM’s own Hokusai exhibition last year made similar links. By coincidence, this small exhibition included the links between a Chinese artist, Li Hua, and the German Kathe Kollwitz. I had come across Kollwitz only recently, admiring her very powerful prints in Tate Modern’s Aftermath; Art in the wake of WWI exhibition and was astonished to encounter her again so quickly and in an unlooked for place. This little FREE exhibition runs until 22nd October 2018 and, while it is too small to warrant a special trip, it is well worth looking into if you happen to be near Great Russell Street. And you can always wander around that magnificent and unending house of treasures which is the British Museum while you are about it – now the Summer holidays are over it’s rather less crowded, we didn’t have to wait to get in at all last week and even the Egyptian galleries were relatively easy to walk through. This entry was posted in Art, Culture Vulture, History, London and tagged Art, History, London, Worth a visit by juliej. Bookmark the permalink.